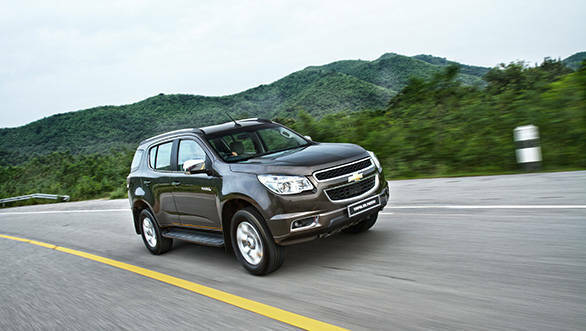 Chevrolet India will be launching its big brute SUV, the Trailblazer on October 21, 2015. The SUV is 4.8m long, 1.9m wide and stands at a height of 1.8m. It will come in via the CBU route and will be available in a single top-spec LTZ trim. The car weighs in at 2068kg and has a wheelbase of 2,845mm, with a massive ground clearance of 231mm. The fuel tank capacity stands at 76 litres. On the looks front, the new Chevrolet Trailblazer SUV is burly, like em all big SUVs do and has projector headlamps. It is based on a ladder frame chassis and gets 18-inch wheels. On the inside, the new Chevrolet Trailblazer SUV has black dashboard with beige upholstery, a Bluetooth-enabled touchscreen infotainment system, multifunction steering wheel, leather seats with electric adjustment for the driver and automatic climate control. While globally there are two engine options available for the Chevrolet Trailblazer, the Indian market will get the higher-spec 200PS 2.8-litre turbodiesel motor with a 6-speed automatic transmission. While 4-wheel drive is offered internationally, the Indian market gets a 2-wheel drive option. GM isn't expected to discontinue the Captiva since it is brought in as a CBU as well and according to the company has decent demand in India. We expect the 2-wheel drive Chevrolet Trailblazer to be priced around Rs 27 lakh, just below the AWD Captiva.